A memorial plaque to the New Zealand soldiers and Afghan forces who died in Bamyan Province in Afghanistan now stands in the "new town" area of Bamyan. The Governor General Sir Jerry Mateparae unveiled the memorial plaque in a ceremony prior to the end of the deployment of the Provincial Reconstruction Team this year. 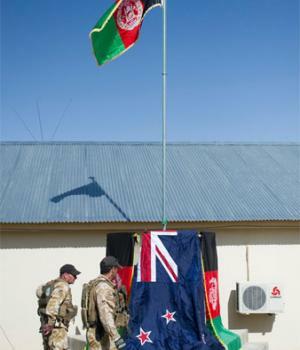 The eight New Zealand soldiers who died in Bamyan are: Lieutenant Tim O’Donnell; Private Kirifi Mila; Corporal Douglas Hughes; Lance Corporal Pralli Durrer; Lance Corporal Rory Malone; Corporal Luke Tamatea; Lance Corporal Jacinda Baker; and Private Richard Harris. Corporal Douglas Grant and Lance Corporal Leon Smith from the SAS died in Kabul and are commemorated on a memorial plaque in Kabul. Three memorial stones were unveiled in Bamyan. One carries the names of the 19 members of the Afghan National Police who have died in the province, another has the four names of the National Directorate of Security who have died, and a third contains the names of the eight New Zealanders who have died in the province. On the same day the Governor-General spoke at a ceremony as the New Zealand flag was lowered at Kiwi Base for the last time, he said at the unveiling of the memorial, "Names etched in the cold of stone can never replace the warmth of a human life. Memorials, however, stand to remind us of those who made supreme sacrifice and the significance of why they served. The New Zealanders whose names we recall and whose names are etched on this memorial continue a proud tradition. It is a tradition of ordinary men and women who stepped forward to serve a higher calling." "Like thousands of New Zealanders before them, they left the distant comforts and security of home to respond to tyranny, to defend democratic values, and to bring peace to troubled lands. They stepped forward, knowing all too well the risks of service, because they wanted to make a difference to the lives of the people of this country. They stepped forward and served with honour and distinction. Their service exemplifies the best traditions of the New Zealand Defence Force." New Zealand's initial involvment in Afghanistan was with the deployment of the SAS in late 2001 for a full year. From September 2003, the New Zealand Defence Force took command of a Provincial Reconstruction Team, initially set up by the United States, to assist with providing a secure environment and to help with reconstruction and development. More than 3500 New Zealand Defence Force personnel were deployed to Afghanistan in that time with most serving with the Provincial Reconstruction Team in Bamyan.